Download it for free right now. You will get the book in PDF, ePub and Kindle formats, together with 100 HTML & JS examples! Tips on chaining, organizing your code, using the power of the DOM to your advantage. Learn how to optimize your jQuery code and how to squeeze every bit of performance. A collection of tricks on working with events, making your code work on touch devices, chaining event handlers and more. Tips on working with deferreds, useful third party APIs, scraping HTML content and more. A collection of must-know plugins for modern web apps, with examples and live code. jQuery Trickshots is 100 little 'aha' moments — some are simple, some are complex, all are useful. Martin's writing is clear and to-the-point, and all of the examples are from real-world situations that jQuery developers encounter every day. Highly recommended. jQuery Trickshots is a fun collection of useful code that will help improve the usability and performance of your website. Reviewing each one of the trickshots will expose you to all kinds of jQuery techniques to which you might not be aware. A must read for client-side developers. Very useful book! I was surprised that so many things were possible with jQuery that I hadn't heard about. 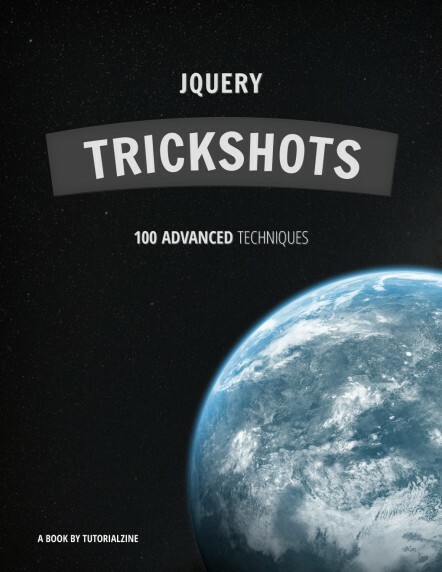 Reading jQuery Trickshots was a fun learning experience. I highly recommend it.